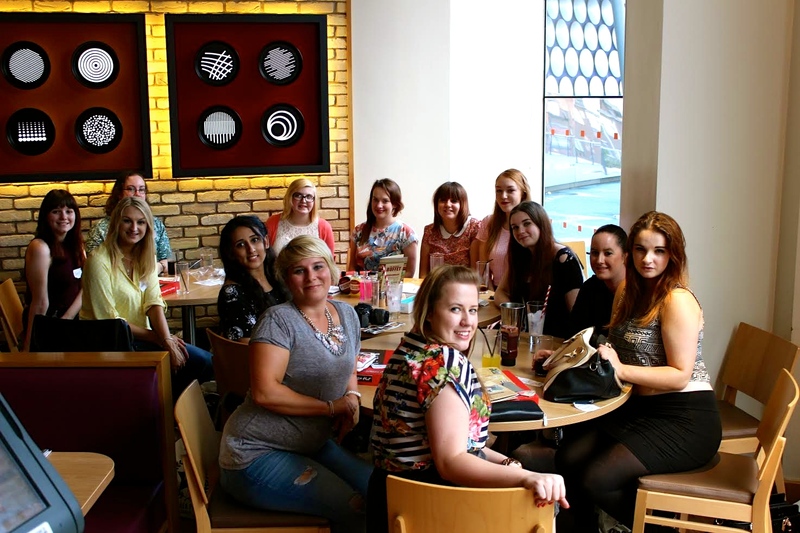 On Saturday, despite the rain, I took myself off to Birmingham City Centre for my first every blogging meet-up and had the best time! This fabulous get-together was organised by the lovely Jess and Katrina and involved a lot of shopping, a lot more eating and lots of girly chat! It was so good talking to fellow like-minded people about all things blog related, without thinking ‘am I boring them’, well I may have been, but everyone seemed really keen to share advice and experiences! After meeting at the bull we took ourselves off to the mecca that is Selfridges beauty hall and headed straight for the Mac counter, which, as usual, was rammed! We just meandered looking at all the pretty jewel colours of the beauty hall, and in the process I think we may have intimidated some of the beauty assistants!! We then decided to split into two groups, so we didn’t all get lost! The little group I was with headed to the Primark stand, refraining ourselves from purchasing anything and then wandered over to the Charlotte Tilbury counter to ogle over the delights there. Coffee was calling us, so we headed down to Starbucks for refreshments and to get to know each other a bit better. 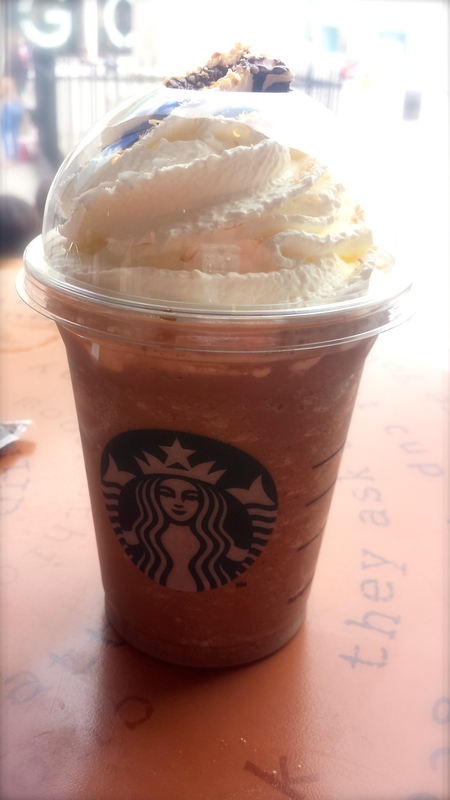 I, of course went for my current favourite, a Mocha Coconut Frappuccino, I could am totally addicted to these! After a bit more shopping, we did what all beauty bloggers do, and headed to Lush to have a play and meet up with the other girls! I love Lush (as if you didn’t already know! ), but managed to refrain myself from buying the store’s contents and just left with a comforter bubble bar, as I have nearly finished mine! We followed this up with some more shopping in the palace that is Primark! And of course, some serious damage was done! I may do a bloggers meet up haul?! All shopped out and pretty pooped, we headed to Pizza Hut! I haven’t actually been in a Pizza Hut since 2006, so I was like a little teenager all over again! When we arrived, we had a nice corner at the far end of the restaurant away from everyone else, I suppose this was just in case we got rowdy!! On our seats we were greeted with some fantastic goody bags, which were carefully organised by Kat and Jess, and boy, these were impressive! I just wanted to tip it all out on the floor and rummage through all the goodies! If you want to get your hands on one, Jess is doing a giveaway for the remaining goody bag that was left over on her blog here. 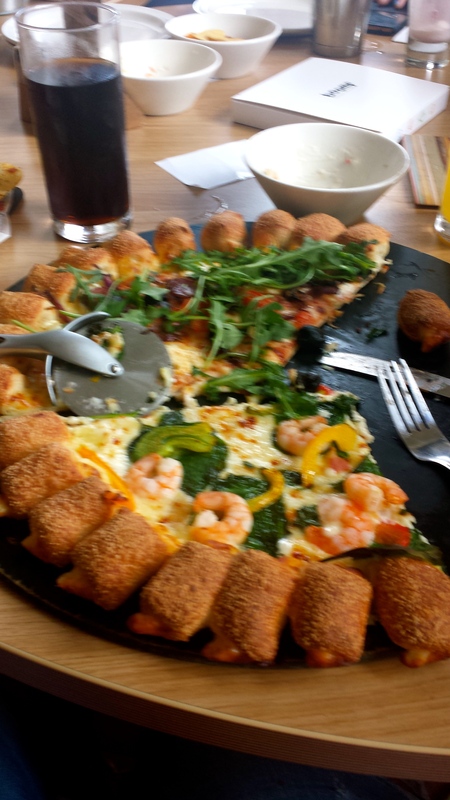 Refraining myself from embarrassment, I just had some cheeky glances at appropriate times throughout the pizza scoffing, of which there was lots! Also on the tables when we arrived were these cool marshmallows! They were created by Boomf and they had the logo from the meet up on them in 3 different designs! These would make a great corporate gift or even wedding favours! The meet-up was drawing to end, but not before we had a lovely talk from Becky who makes cosmetics and sells them online under the name Harlequin Cosmetics . These are all handmade by her and her mom, along with a few local soap makers! We got to smell and play with some of the products and I walked away having purchased a California Daze Body Butter and a shower gel in Paradise. The body butter smells so zesty and orangey and the texture is oh so creamy! It is possibly one of the best body butter textures I’ve come across. The Paradise shower gel is coconut heaven, and I love anything with a coconut smell! Becky and her mom are currently looking at a vanilla range and also playing with ideas for Christmas (damn I had that word!) and I can’t wait to see what they come up with! I was so sad to leave the other girls and come home, but it was such a great afternoon and everyone was so friendly and lovely! I can’t wait to attend my next blogging event! 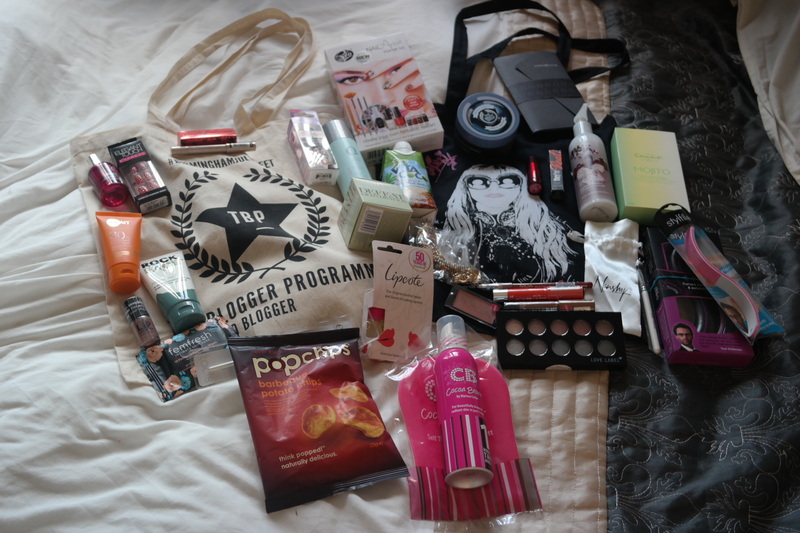 Keep your eyes peeled for some review posts of some of the products that were in our super duper goodie bags!